Indara Caerellia is an Imperial who lives at Corpselight Farm in Falkreath with her husband, Mathies. Their only daughter, Lavinia, was recently killed by Sinding, and husband Mathies will ask you to investigate in the quest Ill Met By Moonlight. When you visit Falkreath for the first time, go to the graveyard and you will witness Indara and Mathies listening to town priest Runil giving their deceased daughter the last rites. After the sad ceremony, they will all go their separate ways; Indara sleeps inside the farmhouse every night between 8pm and 4am. After waking up, she was supposed to be working the crops behind the house for 16 hours straight, but due to a serious bug she spends the entire day stuck between two rocks near the cemetery, along the road leading east from the Hall of the Dead. The bug also prevents her random activities, such as eating and relaxing. She wears a set of farm clothes, a pair of boots, and a pair of gloves. She is equipped with an iron dagger, and carries a key to the farm as well as a selection of common items and gold. 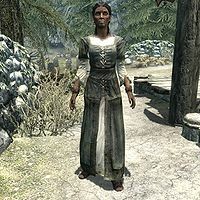 When approached she will politely explain her position in Falkreath: "My husband Mathias [sic] and I tend Corpselight Farm." She will then elaborate: "Falkreath is a hard place and tending a farm here is thankless work." She also admires her husband and will often say: "Mathies is a kind and wise man. The Nords could use more like him. So could the Imperials." She does not support either side in the war and will remark: "How could people see all the graves in Falkreath and still want to make war?" While you can't ask Indara anything, her husband is more talkative and will mention her when asked why Falkreath is so gloomy: "Yes, and I couldn't tell you why. My wife and I think there's some dark magic at work. Or perhaps Arkay's influence is strong here, and he likes to keep it this way." He will also mention her in many of his greetings: "Indara and I like to keep to ourselves and run our farm. ", "Runil has been a true friend to my wife and I in our time of need. ", "My wife, Indara, has a gift with animals. It makes her a better farmer than anyone I've ever seen." and "This war isn't needed. Imperials like my wife can be hard to handle but we Nords could work with them. I should know." Runil: "Ah, Indara. Arkay's blessing upon you and your husband. Spend as much time here as you need." Indara: "Thank you, Runil. Your support means much to us." Indara is a member of the warrior class, which determines the level of her skills. She was supposed to have played a role in the unfinished quest Runil's Dark Past, and her dialogue will never be heard: "I knew he was troubled, but one of the Thalmor? I wish I could say I did not believe it. Thank you for telling me." Her farming package, FalkreathIndaraFarmingSandbox4x16, mistakenly points to an invalid underground marker, making her stand idle between the rocks all day, instead of working the farm as intended. This bug is fixed by version 1.0.1 of the Unofficial Skyrim Patch.